Victims, Perpetrators, Bystanders and Collaborators as historical concepts: Redundant labels, useful categorisations or somewhere in between? There’s a big fashion for categorising bystanders, perpetrators and so on, why? Everyone collaborated! The twentieth century saw the concepts ‘victims’, ‘perpetrators’, ‘bystanders’ and ‘collaborators’ entering not only historical study but public discourse surrounding instances of war, atrocity and genocide. However, these terms also have a broader application outside of the twentieth century, in contexts of earlier imperialism, religious iconography and revolution. Despite this near universal application, there has been surprisingly little critical evaluation of the conceptual utility of the aforementioned terms amongst scholars. Problems associated with the dearth of engagement in our understanding and usage of these words include reductionist tendencies that can obscure nuance and disregard the experiences of individuals whose stories are not so easily classified. This conference aims to provide a forum for postgraduate students and early career researchers to begin to facilitate vital discussion as to the future of these often problematic concepts. Submissions with an interdisciplinary approach are particularly encouraged. Please send a 250 word abstract for a 20-30 minute paper and a brief biographical statement to Kate Docking and Ellis Spicer via southeasthub2018@outlook.com by 16th March 2018. This fascinating talk should interest anyone who is interested in medieval history or art history – as well as lovers of Paris. The Sainte-Chapelle is just a few steps away from Notre Dame, hidden away in the Palace of Justice. It was built for King Louis IX in about 1241 to 1248 to house his collection of religious relics and has been described as one of the most beautiful buildings on earth. Its interior is dominated by 15 huge stained glass windows but, as Dr Guerry will explain, every inch of the remaining wall surface and the vault was also richly painted and decorated with remarkable images, patterns and motifs. If you have any questions please contact canterburyha@gmail.com. 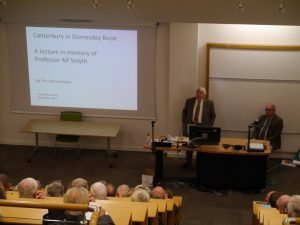 On Friday 27 October 2017 friends and colleagues from the School of History, the Canterbury Archaeological Trust, and Canterbury Christ Church University gathered together in Grimond Lecture Theatre 1 on the University of Kent’s Canterbury campus to celebrate the life of Professor Alf Smyth. Professor Smyth, who passed away in October 2016, was an Emeritus Professor of Medieval History, specialising in the British Isles. His publications included Scandinavian Kings in the British Isles, Warlords and Holy Men: Scotland AD 80-1000. and a highly influential study of King Alfred the Great. His distinguished career also saw him take on the roles of Warden of St. George’s House, Windsor Castle; Director of Research; and Dean of Arts & Humanities (both Canterbury Christ Church University). He was also an early supporter of the Canterbury Archaeological Trust. 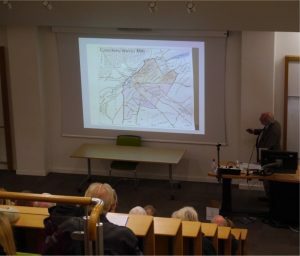 Tim Tatton-Brown, former Director of the Canterbury Archaeological Trust, treated the packed theatre to a lively lecture on the features and landmarks of Canterbury and the surrounding area as mentioned in the Domesday Book. Tim, along with Richard Eales and Professor Paul Bennett, also shared anecdotes about Professor Smyth in what was a fitting tribute to a much respected and missed figure. By Prof. Sivachandralingam Sundara Raja, the Head of Department of History at the University of Malaya (Kuala-Lumpur). 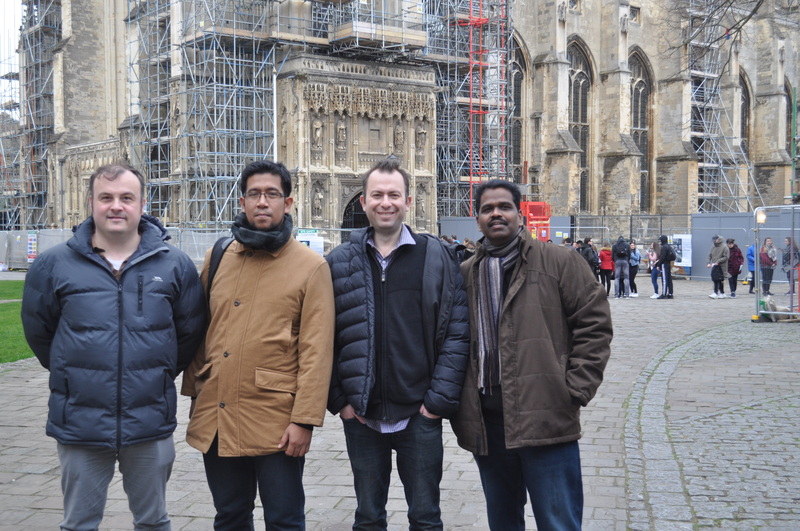 He visited Kent, with his colleague, Dr. Abu Hanifa, on 19-26 March 2017. Can you briefly describe your roles at the University of Malaya, and your area of research? I am currently the Head, Department of History and have been in this position since 1 September 2015. As the head I am assigned with many tasks. I have been given the task of supporting the management’s role to raise the ranking of University Malaya internationally (World University Ranking) to make sure we would soon be one of the best 100 universities in the world. I am also tasked to plan and implement academic programmes at the department level; to plan staff recruitment for the department; to encourage research activities among staffs; to ensure the department meets its annual Key Performance Index (KPI) in terms of academic excellence, teaching and learning, research, publication and innovation, internationalization and networking, recognition and professional services, income generation, award, promotion initiatives and graduate employability. Finally, I am responsible to provide strong academic leadership in ensuring all academic staffs and higher degree students of the Department play their part to help achieve the KPI set by the university. For the academic staffs, their KPIs are decided based on the Standard Academic Performance Target (SAPT), which includes research, publication, supervision, teaching, consultation, administration and contribution to society/ social work. My visit to Kent is in line with the aim of the university to internationalize and to build networks for the progress of the department and the university as a whole. My main area of specialization is in the field of Malaysian economic history. Nevertheless I am also working on a number of researches, some of which broadly include British imperial history in the late 19th and early 20th century, missionary activities in Malaya and Southeast Asia in the 19th century, contemporary Indians in Malaysia and British policy towards Tamil education in British Malaya. 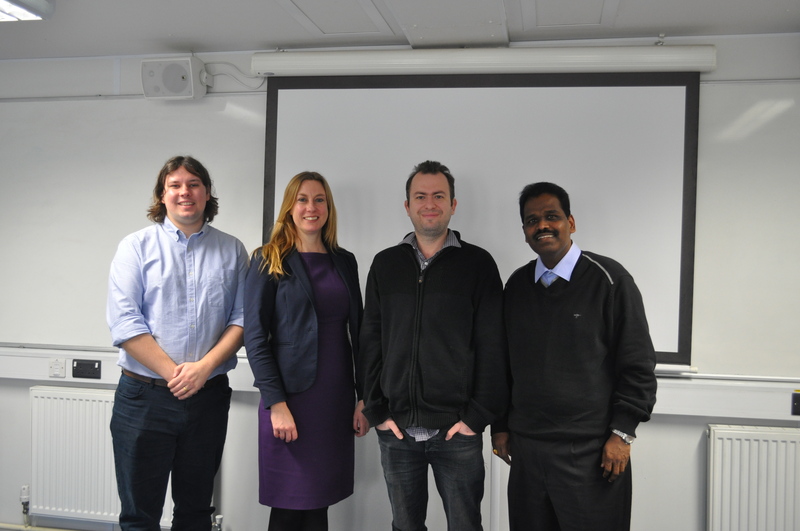 How do you think the School of History at Kent and the Department of History at Malaya can work together? I strongly feel both Departments could work in such areas as student exchange especially for the undergraduate level, exchanges of staffs specializing in Malaysia and Southeast Asian History, Research Collaboration/joint research activities, exchange of publications, reports and other academic materials and activities and programmes that are of mutual interest. I believe for a start student exchange should be a good option because it will definitely benefit both parties. 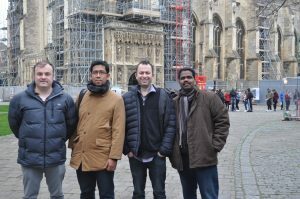 Malaysian students would be exposed to the teaching culture in Europe and the same goes for the students from Kent who will be here. This should be implemented immediately because the department has been offering courses in English and so does the faculty. Student could select a minimum of three courses to ensure it could be implemented soon. Students from Kent would be exposed to a new culture and will get an opportunity to visit the country and exposed to the Malaysia life style that truly reflects what is termed as “Malaysia Truly Asia”. Visiting Malaysia would give them the experience of witnessing three major civilizations mingling around in the country. With a cheaper Malaysian currency Kent students will have a good time in Malaysia. Staff exchanges would be another area worth exploring. I notice much of the work done by the academics of Kent seems to focus on Europe and other continents and not on Southeast Asia. It is here where University Malaya’s History Department would be able to help. Our strength has been on Malaysian History and History of Southeast Asia. Staffs from both departments could embark on a joint research work in medical history, imperialism, technology transfer, education and etc. I had the chance to meet Mr. John Cocking who is working on Higher Education in Malaya under the supervision of Dr. Cohen. His visit to University Malaya and to the Department of History will give him the chance to interact with scholars who have worked on his research subject and also to explore sources in the Malaysian National Archives. I am sure that my academic staffs too will benefit through such collaboration. I have invited Mr. John Cocking to the department where we could house him in one of our academic rooms for a period of 6 months for him to conduct the research in Kuala Lumpur. Academics from both departments could also explore the possibility of co-authoring books or articles once this relation has been cemented and there is a confidence it would be a great success. Another area, which the collaboration could be implemented without any hassle, is exchange of publications, reports and other academic materials. We would definitely like to learn from Kent’s experience in successfully implementing its undergraduate and postgraduate programs. 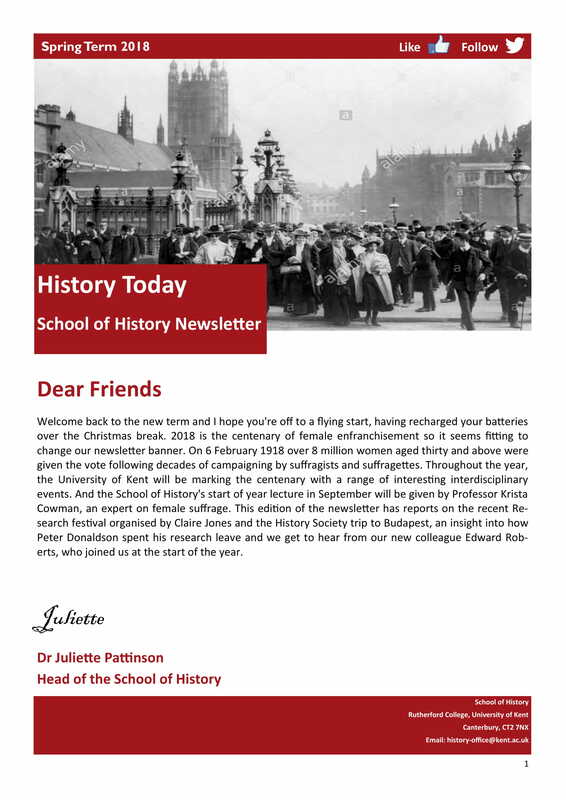 For a start we have received the School of History Undergraduate Student handbook, 2015-2016 that informs us on how Kent undergraduates are managed. Such experiences are worth to be shared for enabling further enhancement of our departments. 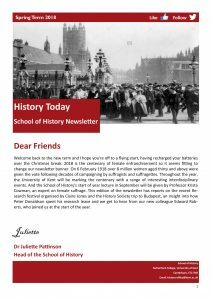 Our exchanges could also be in the form of newsletter, bulletin, department reports, articles and others. We could even create a link in our website highlighting our joint programmes, where it will bring to the attention of both sides on what we have and how we could benefit. The trip was truly satisfying because it was well organised by Kent and what more with Dr. Phil Slavin and Dr. Mark Lawrence were there to welcome us when we arrived. They showed us the beautiful town of Canterbury, which has many major attractions to offer. The field trip was educational and enjoyable. We were accommodated at the House of Agnes, which was a pleasant surprise because it was nearby to all amenities and convenient also. My colleague, Dr. Abu Hanifah, and I spent a whole day visiting the town and I must say it was a lovely experience. We were able to buy many academic books at a discounted price. Besides that we enjoyed the western and Indian cuisines that Canterbury had plenty to offer. Our breakfast at the House of Agnes was also great and on the whole the university staffs and the people of Kent were very hospitable during our stay there. We treasure our days in Kent and are looking forward for more such visits in the near future. I must also say that visiting Canterbury also enlightened me on many things. As it turned out a habit for me to buy a book in any country that I visit, I bought a small book that deals about the town. The book, which is authored by Alexander Tulloch titled The Little Book of Kent, contains many interesting and fascinating information. First is the fact that there are more castles in Kent than any county in England. Second, King’s School, Canterbury was founded in AD 597 by St. Augustine and which is almost 1,000 years older than Eton. Finally, Ian Fleming who is from Bakesbourne, a village near Canterbury had allegedly given James Bond the code name 007 after the bus service that ran between Canterbury and London. Bus number 007 is still the one to catch if one were to travel from Canterbury to London. I also enjoyed meeting many of the academic staffs of the Department. Dr. Juliette Pattinson who is the Head was kind and welcoming. 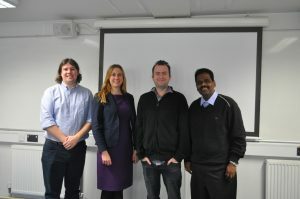 She and her colleagues, Phil Slavin, Mark Lawrence, and Mr. Jon Beer were the first to brief us on the strength of the Department and suggested ways in which both departments could collaborate. Our meeting with Dr. Stefan Goebel and Dr. Andy Cohen was indeed enlightening because he dealt with the postgraduate programmes of the department and how the students were graded. Meetings with the individual research head of the centres of History of Colonialism, Study of War, Propaganda and Society, Political Economies of International Commerce and History of Medicine, Ethics and Medical Humanities, were very meaningful and educative. I have gotten a clearer picture on the role of these centers and how we could collaborate with them. I believe our visit to the Department of History, University of Kent has helped us to understand our strength and the many ways we could foster a meaningful cooperation in the near future.